 330 feet PLA and PСL filament included in the newest 3D Pen Set: get amazing present box for  girl, boy, teen and adult with all accessories needed to enjoy drawing. Cute 3D Pen ideal for kids as it comes with customized 3d pen stencils and includes easy-to-follow instructions to get started with 3d Drawing ideas. - 3D printing pen ink is a recyclable refill only. - Mini 3D pen heats the 1.75mm filament; it will extrude from the nib in a semi-liquid form. - The PLA PCL filament cools almost immediately, forming solid intelligent 3D pen art work. Both 3D Pens filament types are safe for children and adults. However, the 3D Pens nib does get hot. ❗❗ Don't touch the 3D pen nozzle or tips when the pen is in use. Pro 3D pen is perfect  birthday creative and educative gifts idea for artists from 5 to 99 year old.  Your satisfaction with 3D pen sets is our priority: If you are not happy with 3D pen starter kit, we offer a 30-day money-back guarantee. ✅Order now and get 10 year warranty.  Still drawing on paper? 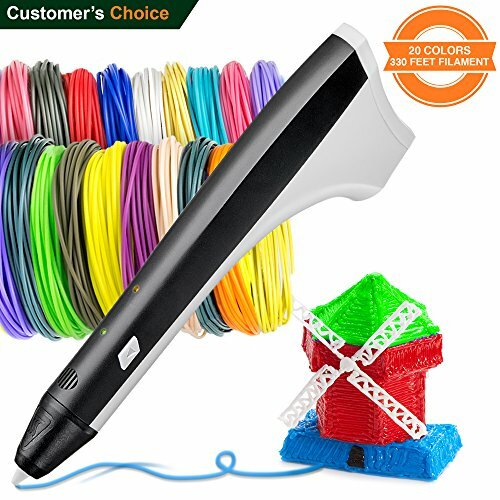 Let`s try cool 3D Doodler Pen for Beginner and Advanced Levels! If you have any questions about this product by BeTIM, contact us by completing and submitting the form below. If you are looking for a specif part number, please include it with your message.